Medical students can learn about all the nerves in the face with these printable health flash cards. Olfactory Nerve(I) Carries special sensory (smell) nerve fibers. Bulb of CNI sits on cribriform plate of ethmoid bone. Sends fibers into nasal cavity. Optic Nerve(II) Carries special sensory (vision). R&L nerves cross at optic chiasm. Exits cranial cavity through optic canal. 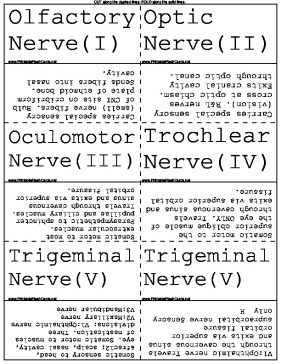 Oculomotor Nerve(III) Somatic motor to most extraocular muscles. Parasympathetic to sphincter pupillae and ciliary muscles. Travels through cavernous sinus and exits via superior orbital fissure. Trochlear Nerve(IV) Somatic motor to the superior oblique muscle of the eye ONLY. Travels through cavernous sinus and exits via superior orbital fissure. Facial Nerve(VII) Somatic motor to muscles of facial expression. Somatic sensory (external acoustic meatus and skin posterior to ear). Parasympathetic to lacrimal gland, submandibular and sublingual salivary glands, and mucous membranes of the nasal cavity. Special sensory (taste) to anterior 2/3s of tongue. Vestibulocochlear Nerve(VIII) Special sensory to inner ear. Two components: Vestibular branch to semicircular canals. Cochlear branch to cochlea. Enters inner ear through internal acoustic meatus. Glossopharyngeal Nerve(IX) Somatic sensory to palatine tonsils, upper pharynx, middle ear, pharyngotympanic tube,and posterior 1/3 of tongue. Visceral sensory for blood pressure/ chemistry via carotid body. Special sensory (taste) to posterior 1/3 of tongue. Parasympathetics to parotid gland. Somatic motor to one muscle of pharynx. Exits cranial cavity via jugular foramen. Vagus Nerve(X) Somatic sensory from skin posterior to ear, mucous membranes of pharynx and larynx. Somatic motor to palatoglossus, most muscles of soft palate, and most muscles of pharynx and larynx. Visceral sensory from esophagus, bronchi, lungs, heart, and abdominal viscera of fore- and mid-gut. Parasympathetic to smooth muscle of pharynx, larynx, thoracic viscera, and fore- and mid-gut viscera. Special sensory (taste) around epiglottis. Exits cranial cavity via jugular foramen. Spinal Accessory Nerve(XI) Somatic motor to sternocleidomastoid and trapezius muscles. Nerve root is in cervical region and fibers ascend through FM and then out jugular foramen. Hypoglossal Nerve(XII) Somatic motor to all intrinsic and most extrinsic muscles of the tongue. Exits cranial cavity through hypoglossal canal.